The kidnapped black British soldier tells his softy IRA captor Fergus the story. The story apparently is both an African and a European folktale. It was an epiphanic moment when I watched the film 20 years ago, as I was struggling with a difficult and exploitative person, who continued taking advantage of us. I realized that some people cannot change their behaviour. It is their nature. I was wasting my time being outraged. Accept the way people act as their nature, and adjust your dealings with them accordingly. Someone who has lied to or about you, gossiped about you, taken advantage of you, or exploited you will very likely do it again. It is their nature. If you continue the friendship because of their other redeeming qualities, be aware that you will be stuck with the restaurant bills, for instance. And if the villainous one is in your church, smile, but avoid being in a small group, or in situations which require self-revelation with them. Answer their questions with wariness. I have heard a couple of speakers recently, John Arnott and Patricia Bootsma among them, saying that God would never send us sickness. Sickness comes from the Devil. It is always God’s will to heal. 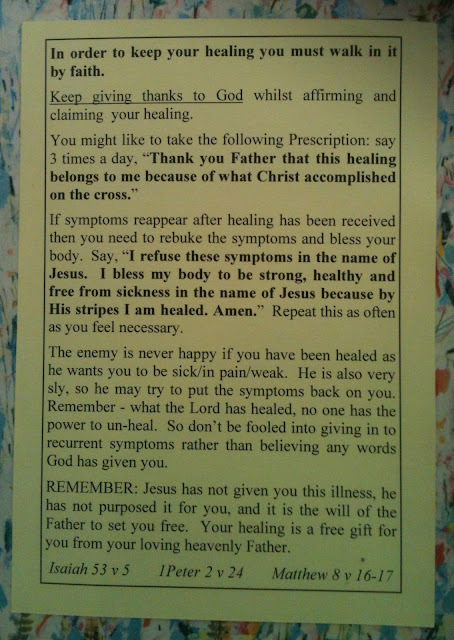 Jesus never refused a direct request for healing. Death made him weep. Smith Wiggleworth, interestingly, believed the same thing. I have been interested recently in how different people have vast faith for different things. Mueller and Hudson Taylor could raise millions by faith alone. Heidi Baker and Bill Johnson have records of remarkable healings. Isabel Allum who I heard last week started off with a rather tedious account of satnavs, medicine, diamond earrings and power tools found after prayer. “The measure—or limits—of our faith is our anointing,” I read today in a fascinating book by R. T. Kendall called “The Anointing.” Those who understand God’s nature of generosity, of provision like a river, experience God’s miracles of provision. Those who understand God’s heart of compassion, how Jesus found it hard to keep his hands off sick people, expect and experience miracles of healing. Faith is like the rainbow bridge between heaven and earth, between God’s power and our need. Or perhaps we could say faith is the key inside our front door that opens it to the power of the Christ who stands outside and knocks. I honestly believe that when we ask God to touch us, to heal our emotional wounds, to heal our suffering bodies, he does. It may be seismic, or it may be the start of a process, but he does. He does not keep his hands off us—spirit, mind, soul or body when we ask for healing; he does touch us, though perhaps not in the way we asked him to. But it takes our faith to appreciate this. Ever more is being understood daily about the interaction of the mind and the body (for instance, in neuro-linguistic programming), so obviously our faith, and our positive self-talk has a role in continuing to seize and embrace this healing. I had been feeling unwell, and exhausted for the last couple of weeks. And so, as I went on my prayer walk, I prayed for God’s healing hands to reach into my inner being, and touch and heal me. I also prayed that they would reach into my spirit, emotions, mind and memory, and heal what hidden scars, wounds or memories might have contributed to my weight loss battle. And I sort of felt his hands touch me. It was amazing. I came back feeling well and energized. The two week battle with a cough and exhaustion was over. I was happy. 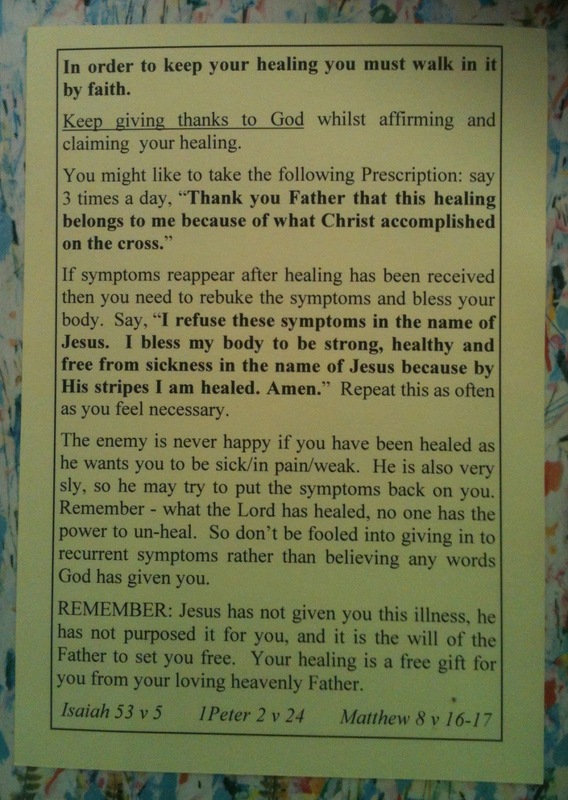 Apparently, the phenomenon of healing coming and going is not uncommon. A friend of mine has had chronic neck and back pain (undiagnosed, perhaps SPD) for years which gets better after prayer, and then relapses. What’s going on? Peter sunk once he took his eyes off Jesus, once his faith wavered. I wonder, if–once we take our eyes off Jesus, once our faith wavers, once our horrid negative sick-making self-talk begins—our healing also begins to fade. Thanks, Mollie, I find the image of God as a river of loving kindness helps me when I pray for healing! Great post again. The walking and fine weather have helped me, as well, as depending on God for every moment to heal my depression and burnout. The fear is that I will fall back into bad habits. Yet, perfect love cast out fear. I feel those negative thoughts creep in and pray for the strength I need.